Stuck waiting for a delayed flight, I thought I'd write a blog about the advantages of the OFFSET function in Excel. I had a coffee. Then I had another one. I had an Indian head massage (that was very effective). I then reviewed a model to see how easy it was to play with currency conversions where one currency (AED) was pegged to another (USD). Answer: it threw up a few interesting issues. I then checked Facebook and F1F9's cloud based communication system (we use something called Jive). I talk about OFFSET in our training courses because it is used so frequently in non FAST models. OFFSET is Excel's satellite navigation system (I explain): it returns a value with reference to a fixed point. So it shows the contents of a cell that is a number of rows and columns away from the fixed point. My flight is being called and I still cannot think of a single advantage to using OFFSET: it is difficult to explain and review, it is not immediately understandable, it has poor transparency, dreadful audit trails and it is all too easy for it to bring up silly answers and present them as valid. Perhaps its only merit is it helps me reach an immediate and strong opinion about the risks associated with models that do make use of it. Wow, howl or shocked silence: What is your response to a new spreadsheet model? There is a critical point in a spreadsheet's development when that spreadsheet is first shared with someone that has never seen it before. If the new user has a stake in the spreadsheet, then their response might be one of three: wow; howl; or shocked silence. One reason that we work with the FAST standard is to maximise the chances of a wow response. But, from experience, we have learned that often the wow response is a slow burn. F1F9 clients build up a sense of wow over time. As their requirements change and they get used to the FAST model upon which we collaborate, so they appreciate the flexibility, structure and transparency of the model with which we all work. A howl is more likely from a client that has a non FAST spreadsheet model that they offer up for rebuild. We understand their pain. However much our clients accept the long term benefits of FAST modelling, there is a leap of faith required in the short term. An existing model into which much time has been put must be offered up for dissection, analysis and reconstruction. That can be a painful experience. So one thing we do to ease the pain is something called Interim FAST modelling. Interim FAST modelling is FAST modelling but undertaken in an existing non FAST model. There are three elements of Interim FAST modelling. Short formulae are easier to read than long formulae. One reason for long formulae is long worksheet names. So the first thing we might do is to shorten each of the worksheet names on each worksheet tab (Excel 2003: Alt O H R; Excel 2007/10/13: Alt H O R). The trick is to come up with something meaningful in three letters or fewer. We will also identify the last column used in a worksheet and hide columns to the right of that column (Excel 2003: Alt O C H). We will also put in a placeholder label to mark the last row that is used on a worksheet. It is a simple psychological advantage to a reviewer if they know the boundaries of each worksheet - latitude and longitude. Taking a particular section, we will replicate the model logic immediately beneath the original. We will go as far as we can to show how FAST modelling could work in the existing model: colour conventions, row anchored links and calculation blocks with one calculation at the end. We will also have a check to prove that the outputs of our interim modelling match the original outputs. This is a powerful step for a client that is new to FAST modelling. They see their model logic made transparent; they begin to understand the use of flags to answer the question "when? "; they begin to understand why FAST models are so easy to review. They will also see how long formulae are shortened and how few rows become many. In a recent training course, I took 3 lines of existing code and built an interim FAST model. The interim FAST model - built using FAST modelling techniques - used 30 rows. But it was far quicker and easier to review the 30 rows than tease out the model logic in the original 3. Non FAST models tend to use columns in a different way to FAST models. So the final step of interim FAST modelling is to take the interim FAST coding and drop it in a FAST model. This tidies up the whole process: headings and sub headings can be set up; units and row totals can be slotted in and reviewed; quick graphs can be charted. This tidies up the whole process: headings and sub headings can be set up; units and row totals can be slotted in and reviewed; quick graphs can be charted. From our client's point of view, the process of rebuilding a non FAST model is made clear. They can see, understand and challenge the journey that their original model is taking in becoming a FAST model. For us in F1F9, it is an effective means to achieve collaborative modelling and build an effective ongoing modelling relationship with a new client. Coming to accountancy studies late in life, I found myself in the classroom for my 30th birthday. We were on a light industrial estate on the outskirts of Cambridge and the topics for the day - taught by a tutor who is still a legend in the world of financial reporting - were deferred tax and accounting for pensions. I've spent better birthdays - but at least this one was memorable. The other memorable topic from my accounting studies that has served me well through my thirties and my forties has been Modigliani and Miller. I like the highly theoretical world in which they live: no taxes; no transaction costs; perfect information; infinite debt availability; and infinite projects with a positive NPV. But like the best theories, I find that you can take Modigliani and Miller into the real world. Their theory of capital structure, for example, lies at the heart of model optimisation. Their starting point is that capital structure is irrelevant - how you raise money has no impact on value. So we can conclude that there is no point in optimising models. And that is not good enough when you start to consider taxes. Bring tax into the equation and debt finance becomes advantageous. Borrow as much as you possibly can, we conclude. So an optimised model would by default go for maximum gearing. And that is not good enough when you take real debt investors into account. Or risks of bankruptcy. Or credit rating agencies. Or the particular features of debt markets: right here, right now. So Modigliani and Miller tell us how far we need to travel from an idealised world to enter the real world. And as we start to breathe in the polluting atmosphere and swim the muddy waters, so models begin to have a role - describing the real world in some imperfect but nonetheless appropriate and useful way. FAST financial models, with transparency at their core, are designed to satisfy key stakeholders quickly and easily that their objectives are being met. For debt and equity investors, it is all about Modligliani and Miller - finding the optimal mix of debt and equity at levels that satisfy appetites for risk. And a price conscious project sponsor will seek a price point such that the project generates sufficient cash to generate a minimum return for investors but not so much cash as to be uncompetitive. The Business Analysis Lifecycle framework was developed by Tom Grossman. Like all works of great insight – it now seems obvious. However, when we first came across it, it was a real moment of revelation. It makes clear and explicit what had been unclear and implicit previously. This framework has helped us to explain what it is that we do (“spreadsheet engineering”) and what we rely on our clients to provide us with (“conceptual models”). In our training business, it has helped us as we explain to our students the different skills that they will need if they are to add value to their modelling assignments. We are deeply grateful to Tom. 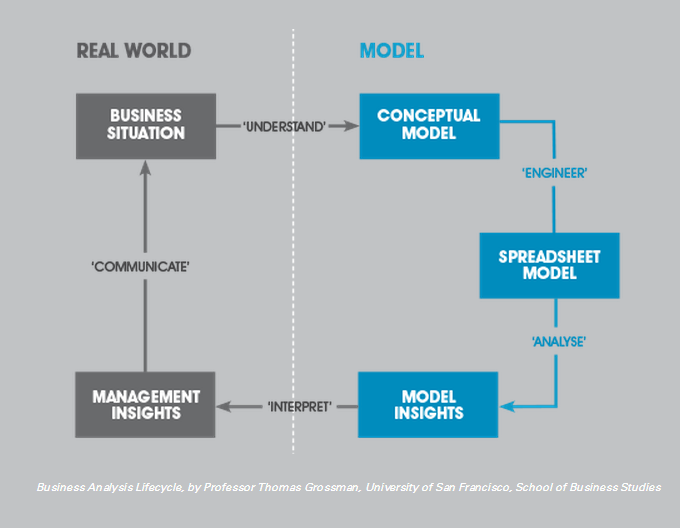 The Business Analysis Lifecycle model divides the world in two – the real world, and the model world. Analysts and financial modellers in particular, live in the model world. It is a well-ordered world where A leads to B, and where businesses can be neatly represented by calculation blocks and inputs. Most people do not live in the model world. Communicating with people in the real world can be a challenge for those who live in the model world. It is important for analysts to do the work of turning model insights into business insights. Managerial insights are aimed at people who are familiar with the business, and the industry in which the business operates, but who are not familiar with the model. A key skill that allows an analyst to progress to more senior appointments is the ability to communicate insights about the business based on analysis of the model. Our latest ebook “Business Analysis Lifecycle – From business concept to the financial model” gives practical advice on how you can effectively communicate and deliver these management insights. Once you have been working with the FAST standard for a while, you begin to realise that one of the most difficult things to get right are labels. Labels - often in column E - should be: descriptive (yes), concise (yes, yes), short, punchy and accurate (yes, yes, yes). And in order to make the single source calculation structure work, they should be unique. We work with unique labels as a matter of course: avoid naming identical things with different labels; avoid calling different things by the same label. Unique labels can also help to bust jargon. And here is an example of where things get full of jargon: interest on a loan. Imagine that you are modelling a project where the first two years are spent building an asset. It is known as a construction period. The thing about a construction period is that - more often than not - there is no revenue. So costs cannot be written off to the income statement because there is no revenue. An income statement relies on revenue since it is a basic accounting principle that costs should be matched with revenue. If you have no revenue, then you have no income statement. You can show no costs. So costs that are awaiting revenue (against which they may be matched) are capitalised. They appear on the balance sheet as an asset. So interest that is charged during construction by a lender is capitalised. It sits on the balance sheet as an asset and is subject to depreciation once the revenue starts to come in. If you model interest during construction as an asset, then what you have determined is a particular accounting treatment for interest. When should this treatment be adopted? Answer: interest should be capitalised when there is no revenue against which to match it. Now let us assume that there is plenty of revenue. There is no requirement for capitalised interest and so interest is taken to the income statement in the period to which it relates. We call this "interest expense due" or "interest payable". Most of the time our model period ends are aligned with interest setting dates. It is one of the facts of modelling that the lender's terms will often determine whether the model is monthly, semi-annual or annual. It makes sense for the modeller to get those dates aligned since interest charged for a particular period can then be slotted into its equivalent model period. One exception would be where the lender has offered zero coupon debt. Zero coupon debt requires no payment of interest until the final redemption period. At this point, all the debt is paid back in one single sum covering principal and interest. Even though no interest is charged until the end, accountants would still accrue for interest in every period. And so should modellers. So what is the difference between interest expense due and interest paid? Often we assume no difference: interest is calculated for a particular period and immediately paid. The same calculation appears in both the income statement and the cash flow statement. And the label reflects this assumption: "interest expense due & paid" or "interest payable & paid". And if there is a lag in payment then a cork screw for an "interest payable" balance would be deployed. What makes the balance go up: interest payable (as charged to the income statement). What makes the balance go down: interest paid (as shown in the cash flow statement). What is important here is that the interest must be paid. There is a contractual obligation that - if ignored - could lead to default and the lender's right to insist on immediate repayment of the loan. But what if there is insufficient cash to pay the interest? One option is for the borrower to draw down more principal on the loan facility to cover the additional interest. The interest is still paid but the amount required to repay the loan increases by the extra amount borrowed to pay the interest. We call this "rolled up interest". Rolled up interest describes a particular funding solution for the interest paid. It does not describe an accounting treatment. The interest is paid by drawing down further on the loan facility that generates the interest in the first place. (b) How is my interest paid financed? Once you have these two questions clear, you begin to realise that there might be various combinations to model. And each combination has a different risk profile. Understanding the different risk profiles is key to understanding a lender's negotiating position. And it all starts with good labels. Download "The Devil's Guide to Spreadsheet Creation" for a light hearted look at how not to create models. Financial modelling is, or at least should be considered in terms of, a team sport - the talents of an individual modeller, no matter how fantastic, are nothing if they cannot work together within a collaborative team to achieve their goals. There are plenty of teams in every sport that have great players and win titles. Most of the time, those players aren't willing to sacrifice for the greater good of the team. The funny thing is, in the end, their unwillingness to sacrifice only makes individual goals more difficult to achieve. One thing I believe to the fullest is that if you think and achieve as a team, the individual accolades will take care of themselves. Talent wins games, but teamwork and intelligence win championships. Take cricket players Shane Warne and Sachin Tendulkar. In their finest hour, the performances of their careers meant nothing because their team, as a whole, did not perform well. In the past, financial modelling was a one-man show with everything depending on the "modelling guru" and it didn't seem to matter that no one else - least of all the client - could understand the model. With the evolution the FAST standard, a common language for collaborative modelling, this is no longer the case. Model building can now be shared among the team, leading to parallel working and great efficiency. Consider the equestrian. Although in the ring there is just one person competing for the ribbon, behind that person there is the horse, the horse’s handler, the trainer, even the saddle - there are many facets involved in making the equestrian a champion. Similarly, in financial modelling, the collaboration of a cohesive team is essential to the completion of a successful model build. What modelling gets you to realise is a simple fact that most accountants just don’t think about: the whole point of inventory is that it excludes any profit margin. The lower of cost or net realisable value means no profit. Not a thing.